Why does it seem that in some periods you can be very busy but manage to get everything done, while at other times you’re constantly playing catch up? Occasionally time seems elastic, and in your corner, but in other periods it’s less accommodating. Or is it just me? Dan and I spent much of last weekend installing a new section of patio. 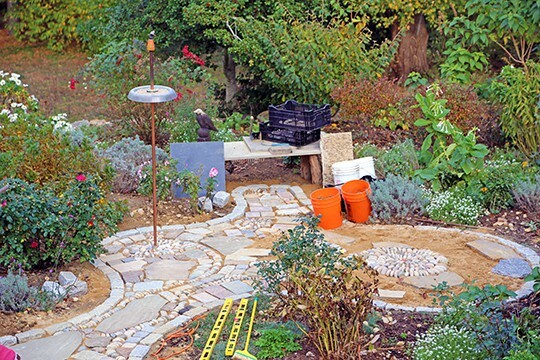 For years we’ve collected round river and beach stones and we were inspired to extend the current “crazy quilt” patio around the bird feeder and into the fragrance garden. Three days later I’m incredibly stiff from this effort and we’re about two thirds done. This patio area includes spirals made of the rounded stones, some natural slate, concrete patio blocks and recycled granite from the local counter-top store’s scrap pile. It’s a fun project because it grows organically…like a garden it takes on a life of its own and defies much advance planning. And like gardening, things don’t proceed at the quick pace we originally envisioned. Kind of like the rest of life. Right now I’m thinking that the phrase “Go with the flow” is the most astute piece of advice I’ve ever heard. Swirling though the fragrance garden, this new patio will connect the bird feeder, bench and 2 chairs and provide some good contrast for all of the plants.